When documents are uploaded, saved and / or processed in Basecone will be saved on the online archive. All documents can be searched with or without the use of filters to narrow down the search in the archive. In the archive you can search for documents using the filters shown on the left menu. You can use one or multiple combination filters to narrow your search criteria. For instance, you can search for documents by using two dates and amounts as a combination with a particular tag. You can refine your search criteria and expand it until you find the data you are looking for. When you click on a line, you can request to see the details of the invoice. You can also browse through the pages of a document and / or resize the document on your screen by clicking on the magnifying-icons. On the top right, you can also choose the option to download the document or print the document here. The document timeline gives you an overview of all the steps that a document has gone through and who carried out which action. You can also view the comment history of a specific document here and who provided these remarks. The document details show the booking details of an invoice with the information that it was booked to the accounting system. 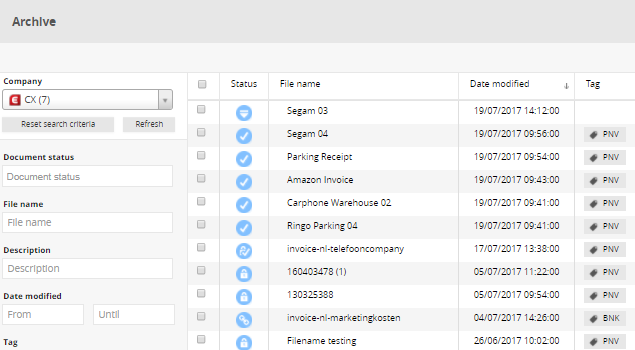 The recognised values such as invoice number or amount will be shown after tagging. When the document is booked to the accounting system, it can find the booking number, account code and other data here. In this way, you can always view how the invoice is booked in Basecone. 📌If your booking details is later adjusted in the accounting system, the document details in Basecone will remain unchanged. This way you can always keep track how the invoice was originally booked in Basecone and by whom. When you select two or more documents, the Download button will appear on the top menu. You can also delete multiple documents via the Abandon button (only if they are not booked yet) or you can download multiple documents. The selected documents will be downloaded in a compressed file (ZIP file). You are only able to download a maximum of 50 documents at once. If you have selected more than 50 documents, the Download button will disappear from the top menu. As an alternative, we can help export the documents for you at a fee. For more information about this, click here.